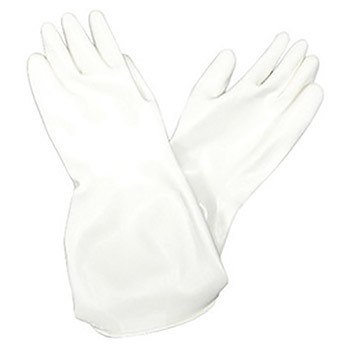 North by Honeywell Hypalon Size 10 X Large White Hand Specific Glovebox Gloves feature solvent based construction that offers multiple layer of Chlorosulfonated Polyethylene. 13" Gloves are resistant to the effects of UV radiation in sunlight and artificial light. They feature high abrasion resistance for durability. The surface of gloves will not hide contamination that ensures easy cleaning. 10 mil Gloves provide soft feel for maximum comfort. Gloves offer superior resistance to oxidizing chemicals and are ideal for use with sleeves. They offer good tensile strength that helps in preventing accidental tears. Gloves are suitable for use in biotech, pharmaceutical, nuclear, defense and semi conductor industries.